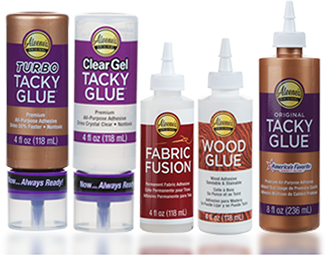 Aleene’s Original Glues - What is craft glue? Craft glue is a glue containing a formula that’s made for adhering more general surfaces like kids' crafts (paper and lightweight materials), hobby projects (non-washable fabrics, lightweight woods, etc.) and basic household repairs, instead of heavy duty projects requiring industrial-strength glues (metal, glass, plastics, etc. ).